In the basement of a well-maintained Bethel CT home I found this technological anomaly. 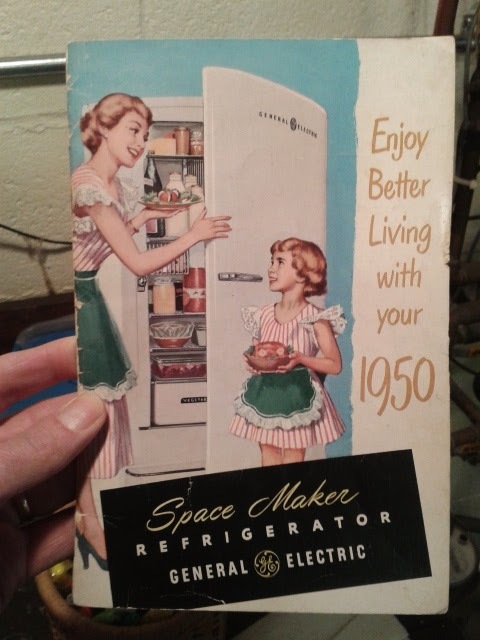 A 1950 General Electric Space Maker Refrigerator - it wasn’t pitted, or rusty or even smelly. It was running smoothly and quietly, it was shiny inside and out and it was keeping things cold. The owners of the home told me it came with the house. I appreciated even more when they happily showed me the original booklet that came with the fridge. I got a kick out of the mother and daughter both dressed the same and no males anywhere to be found. Ahh the Madison Avenue marketing machine in full swing - painting the picture of a perfect world, although maybe an unbalanced one. Kathy, who shared her wonderful appliance with me went one better. In 2015, this would be equivalent to approximately $3000.00 (US). Seems like that appliance should last into the next millennia at that price. 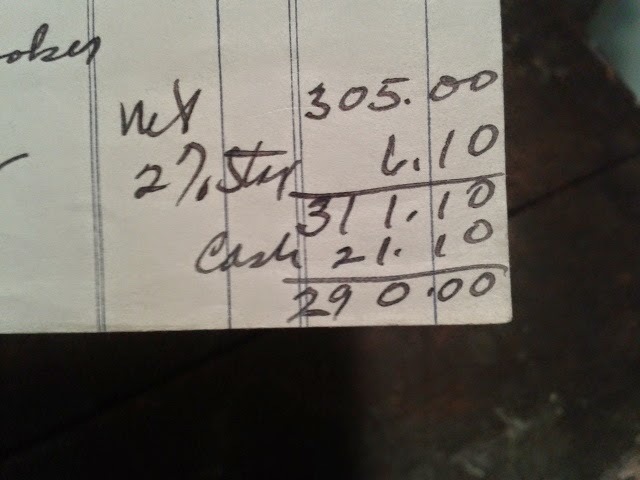 I may have over estimated, when I looked at the receipt closer I realized that he had purchased to other small appliances that day and the salesman did not itemize the prices…interesting. Maybe it was a package? Retro Coca-Cola! Well, a 60-year-old coke in there would have made my day, but at least the owners have a sense of historical accuracy. It may still be for sale if you’re interested and at less then the original price - if you know how to haggle. 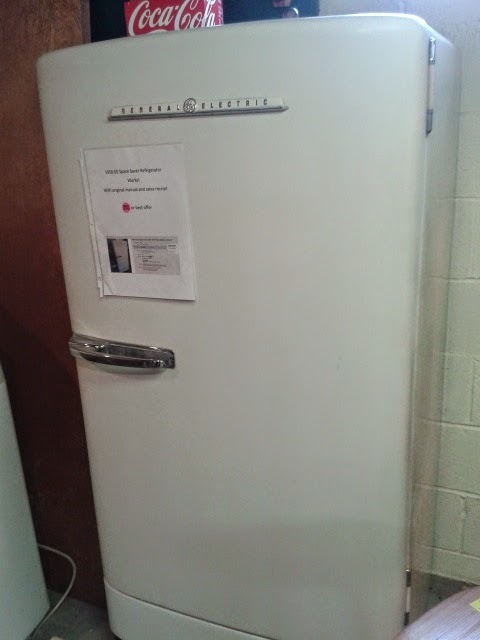 1950 working GE fridge found. You won't believe what comes with it! Updated! 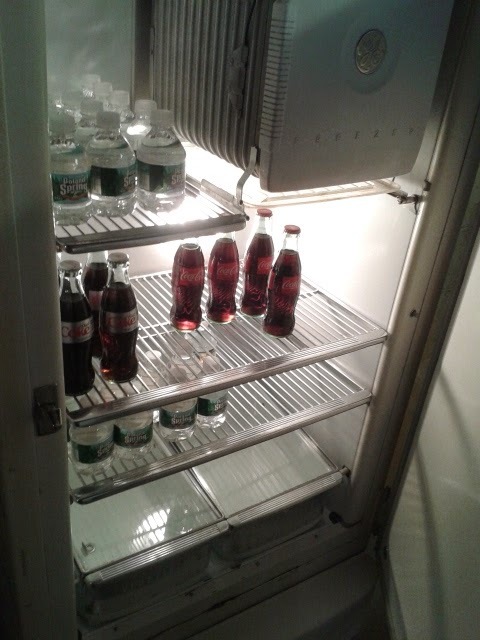 1950 working GE fridge found. You won't believe what comes with it! Read the updated full story here! Forget Google maps...I'm going retro to a dig today. 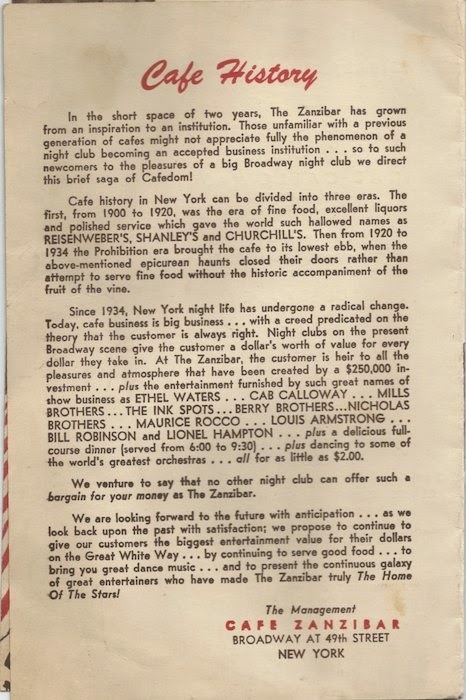 If you wanted a night out on the town in New York City there were plenty of supper clubs restaurants, bars and burlesque theaters. 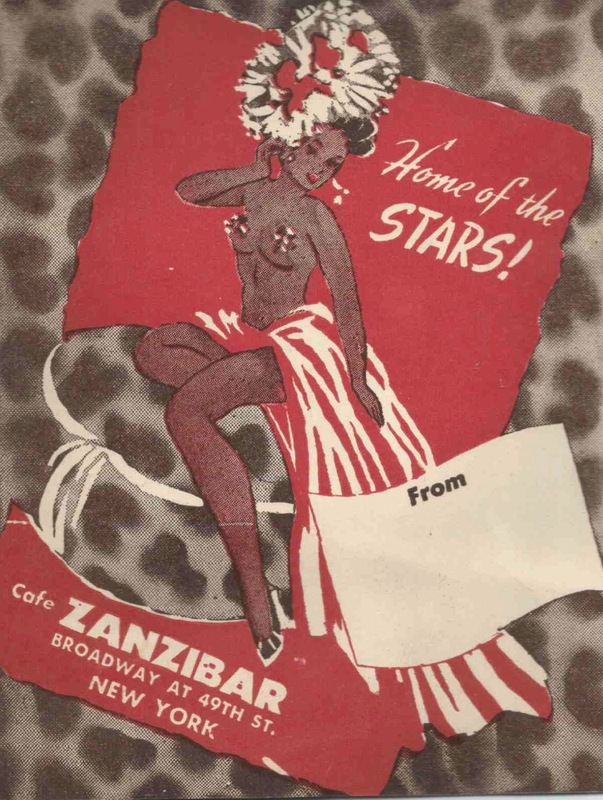 In 1944, there might not have been anything better than Cafe Zanzibar. 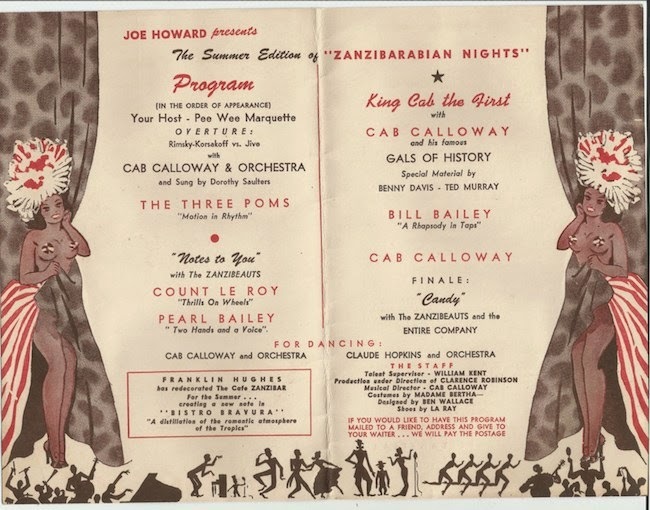 Most historic accounts I have read relate that though there seemed to be less of a segregation issue on the stage, there still existed plenty of favoritism toward white customers when it came to seating. The Cafe called itself “The Home of The Stars” and one look through the program and it was true. Sitting above the Winter Garden Theatre, Zanzibar held a special place on the Great White Way. The artists were paid well and the food was an inexpensive $2.00 (Something like $20 today). This program cloud be mailed to your friends! 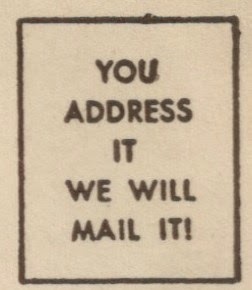 Just address it and hand it to the waiter. They'll take care of the stage. 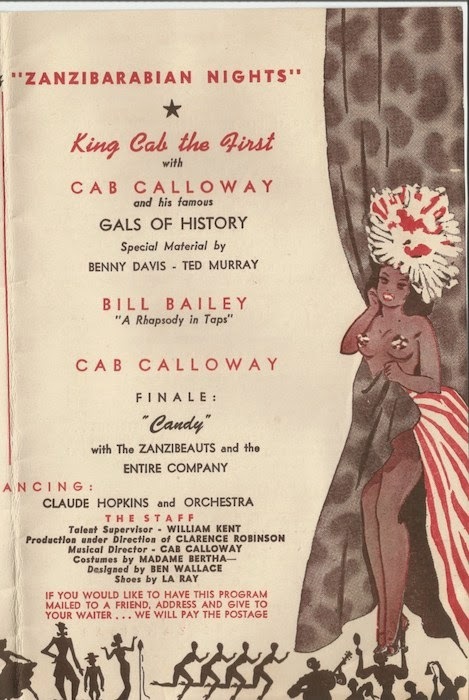 Cab Calloway enjoyed a good long career. He died in 1994. He will be best known by those who remember him performing in The Blues Brothers. His daughter was trying to turn the White Plains home into a museum for her father. A lot of famous people visited there, but I don't know if she was successful in her goal. I wonder what 60yr old toast tastes like? 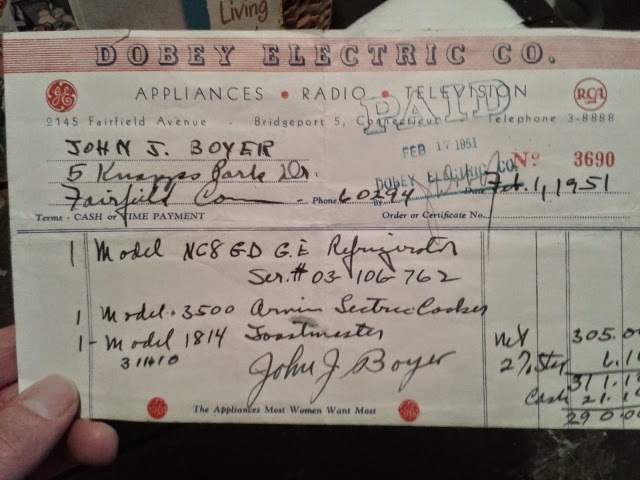 I found this in a closet in the basement of a home in Trumbull, CT. 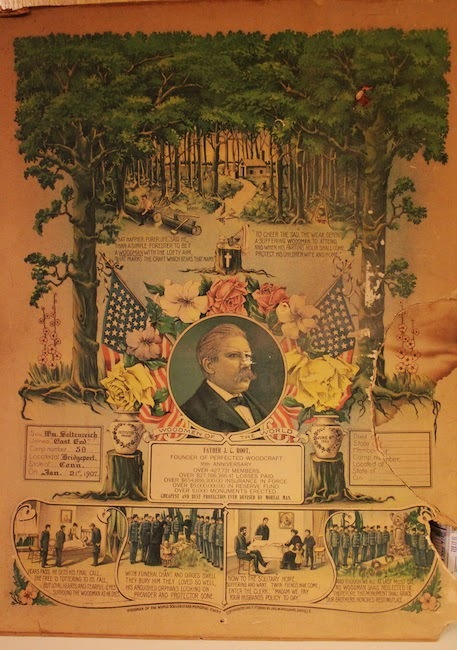 Under some heavy floor tiles was an old poster with colorful illustrations of some detail. It was in poor condition, as though someone tried to extract it without removing the tile. Once freed and seeing a date of 1907 and I knew I had to have it. There are numerous fraternal Socities, more than I can count. Many were secret and recently I discovered this very old one that is no longer secret…to me. A man by the name of JC Root established a society whose main in goal was to do good, protect the defenseless and also sell insurance. It’s not hard to determine which goal came first, but it worked, because Woodmen of the World Insurance is still around. 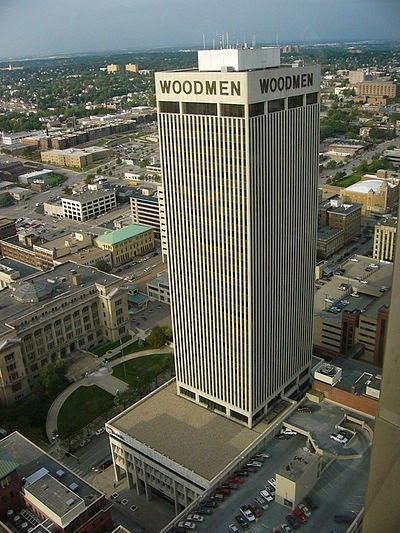 The Woodman Tower in Nebraska was the tallest building in Omaha, until recently. He is there to raise and support a family and carry out the goals of the organization, but who knows what is in store for him? Time passes and he, like the mighty oak, must fall, but who is left behind? Has he planned for the end and the afterward? 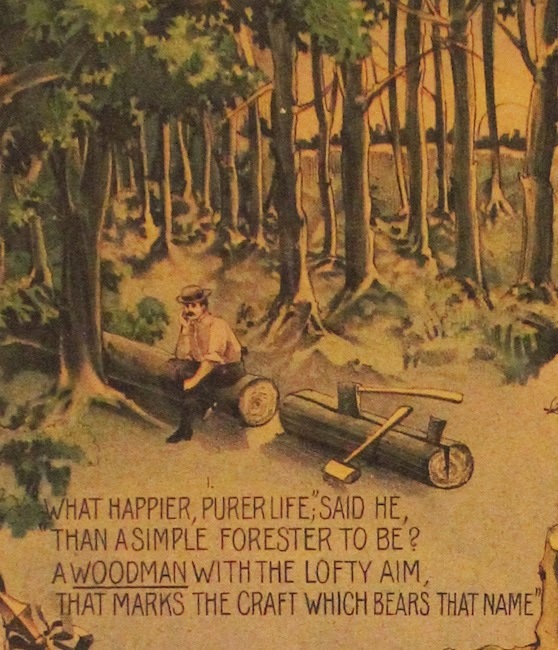 Of course he has, for he is a Woodman of the World! 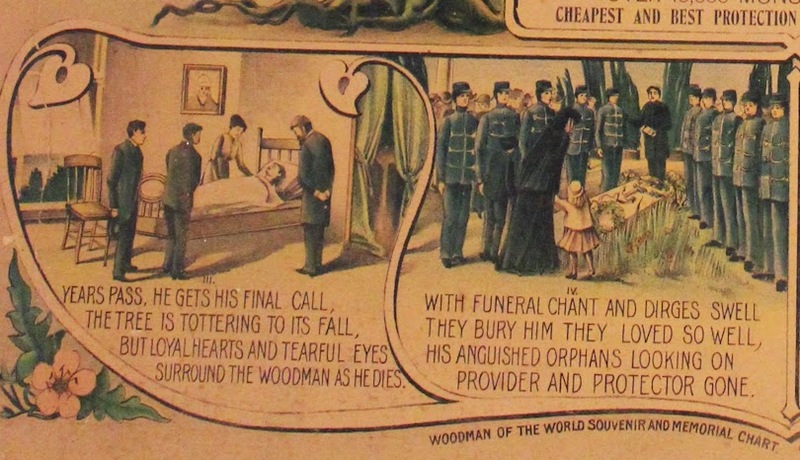 His debt is paid and he will be sent to his final reward, not alone, but with the support of his fellow Woodmen. His family is secure and his headstone is paid for and what a proud and noble structure it is. 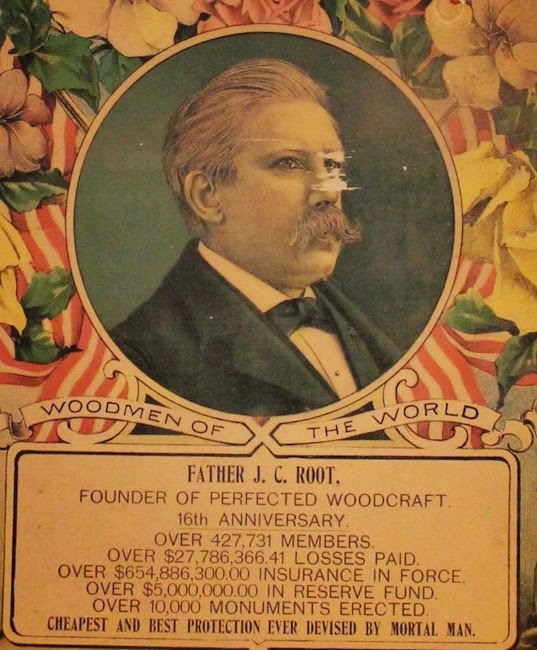 Woodmen of the World was JC Root's second incarnation of his idea, having originally started Modern Woodmen of the World, he became dissatisfied and left to start this one. 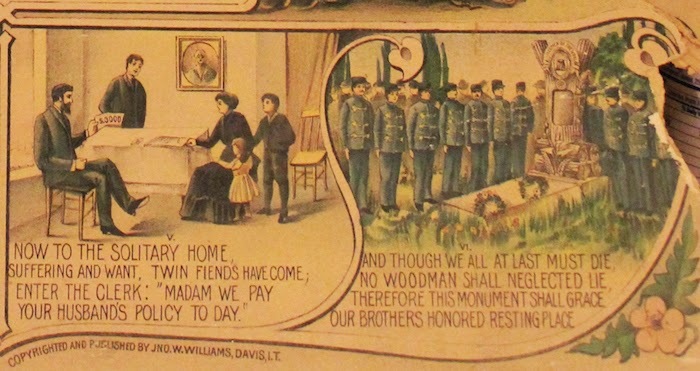 though it started out providing headstones to members upon their death grew to provide many more forms of coverage benefits. 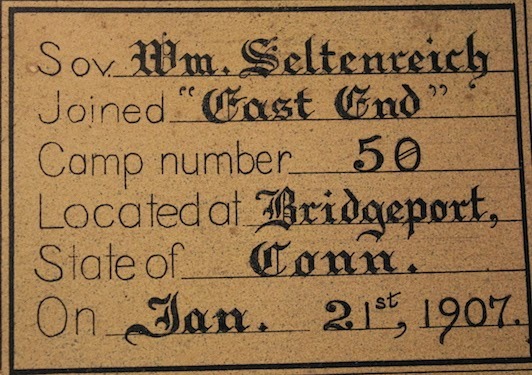 This one that was based out of Bridgeport may have disbanded but there is at least one other in my state and you may already know of the one in yours. UPDATE: After posting this I had several good commentators reach out to inform me that this was no secret society and the changes to the text above reflect that. If the New Haven chapter would reach out to me I would gladly hand this piece over to them. 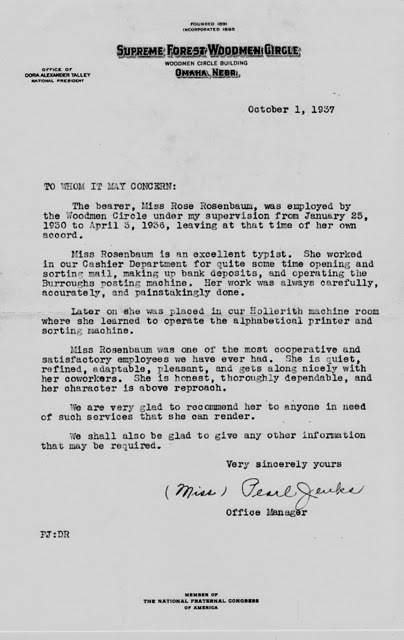 Update 2: A good friend told me that his mother had worked for the Woodmen and left there with this glowing recommendation (below) Thanks Gene! Postcard NYC looking North from Fulton St. 1919. Warren Zevon has been gone many years now, but I still miss him and his brand of music. I met Warren Zevon while at Buffalo State College in 1984. I was a member of the entertainment committee called the Student Union Board and our concert chairman had booked him to perform in the student union building. The night was a blur, but I do remember a strange request Mr. Zevon made a few hours before the show. “I need a skeleton.” Warren exclaimed. Yes, we really embarked on a mission prompted by this unique folk pop star. Heading directly to the science building Warren and 4 of us found a classroom that either contained a full or partial skeleton and/or a pull down chart of the human body skeletal structure. We borrowed one or both and there that sat with Warren on stage for his performance. Warren, this post is dedicated to you. 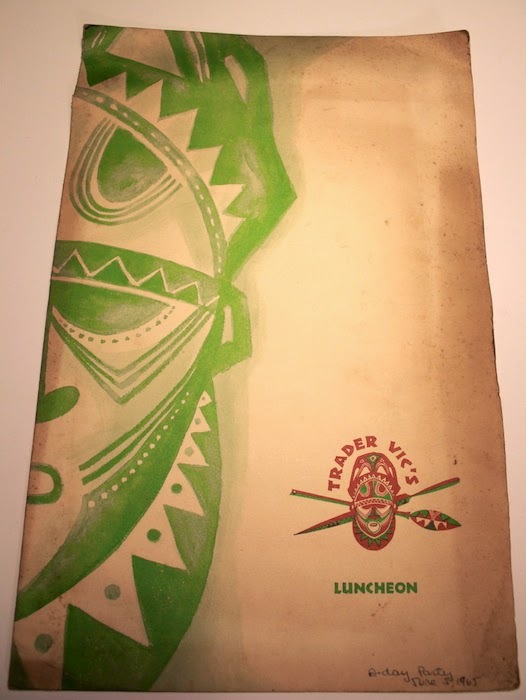 Despite my appreciation for the song lyrics, I didn’t know the significance of Trader Vic's until just a few weeks ago when I found an actual 1965 menu. 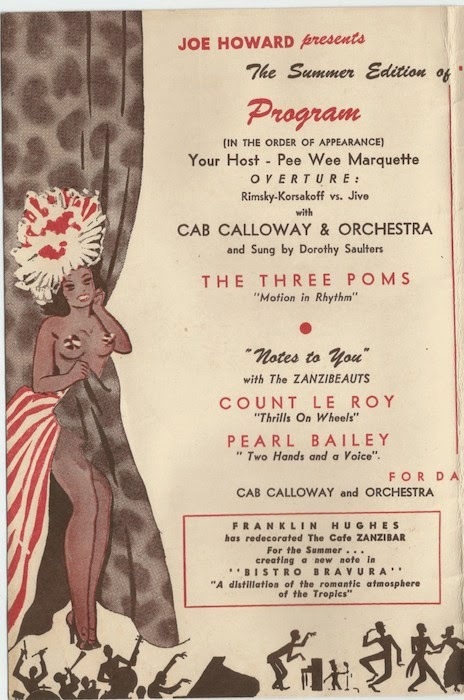 It was a luncheon menu from the New York City location, located for a time in the Savoy Hilton. If you are unfamiliar with Trader Vics, here is the shortened version. 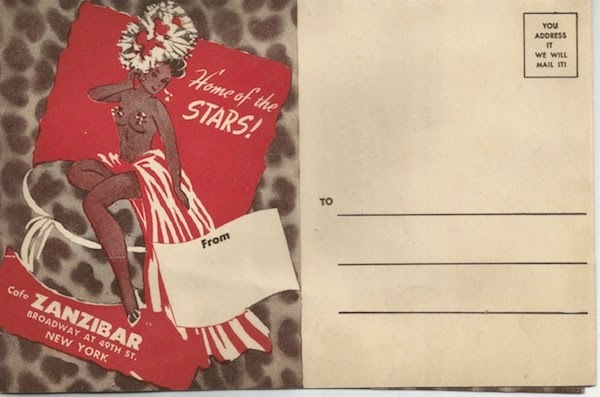 Victor Burgeron opened a small bar/club in California in the 30’s called the “Hinky Dink.” It was a place like many others and it was only after Vic travelled to Hollywood and saw a bar whose style caught his eye, that he got an idea. 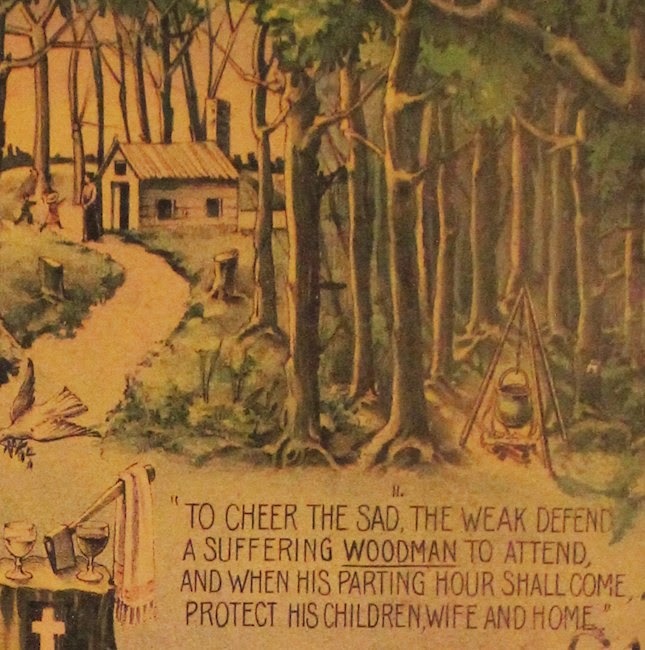 “Don the Beachcomber” was the creation of another vagabond spirit named Ernest Raymond Beaumont-Gantt, who had returned from a South Seas journey and decorated his bar in a polynesian style. 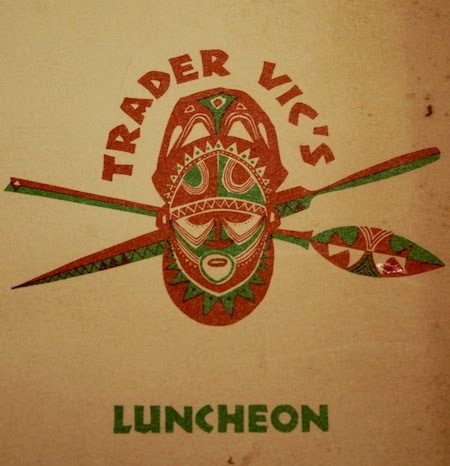 Victor, who felt he could do it better, converted his bar in Oakland to the same style and “Trader Vic’s” was born. In the post prohibition era, a menu of Rum-based drinks was easier with the new availability of the inexpensive liquor. While both claimed to have invented the Mai Tai neither ever came to blows over it, though Burgeron as late as the 1970s was still claiming the title. 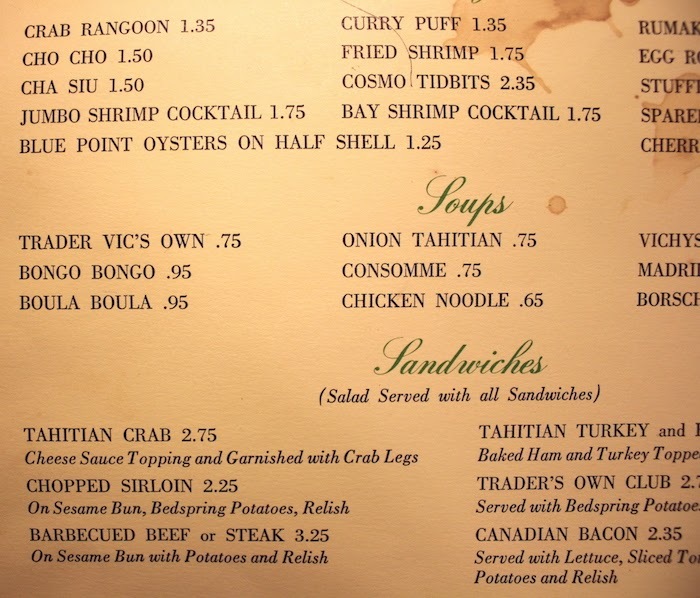 Victor was the better businessman of the 2 and his place became popular enough to open in several other classy locations: Beverly Hills, Seattle, San Francisco, Chicago and Hawaii, and in 1958 Trader Vic's opened in the Savoy Hilton, NYC. The Pina Colada, consumed by the Werewolf in the famous song, was less well know than the Mai Tai, but Warren wrote the song that way. Pina means pineapple and colada means strained, and it wasn’t until the 1950s that alcohol was added to this refresher that was founded in Cuba. 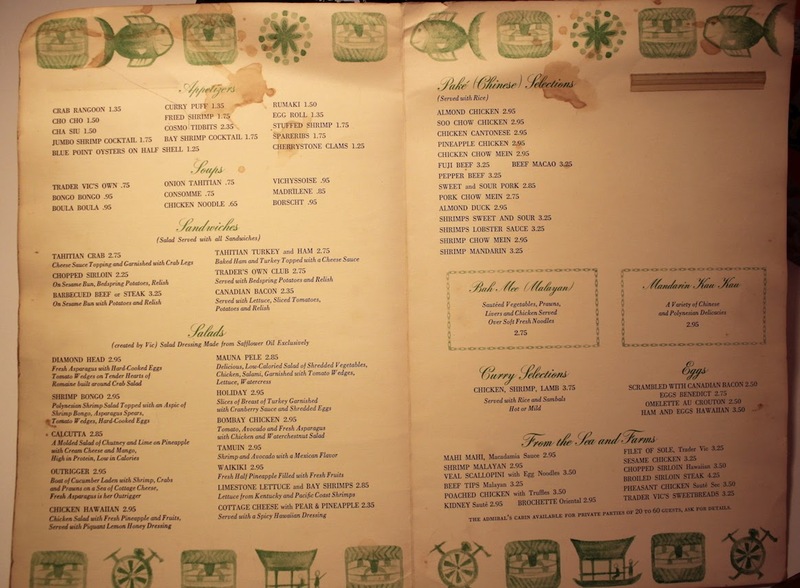 The Savoy Hilton location closed in 1965, making my found menu the last of its kind. The restaurant moved next door inside The Plaza Hotel with a renewed vigor until about 1990. Sadly, it did not survive Donald Trump's purchase of The Plaza Hotel, who felt the decor was tacky and closed it. Many people still remember their memories of escaping there. 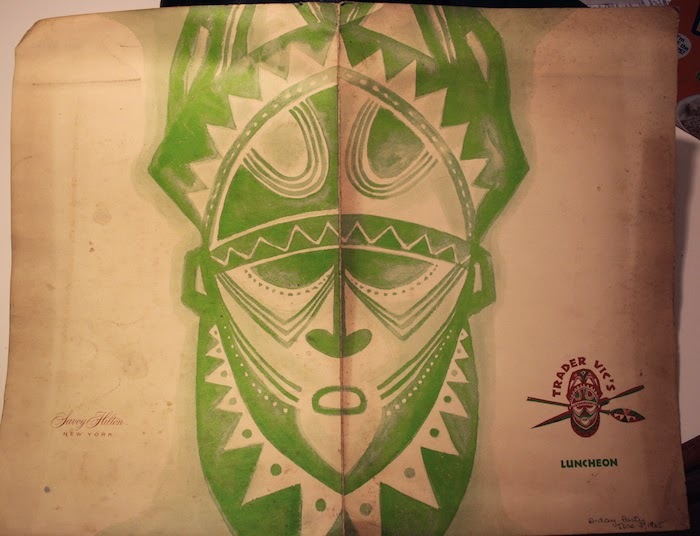 Though Victor died in 1984, the Trader Vic’s brand lives on in 17 countries. My thanks to Greg Morabito, editor of NY Eater and his comprehensive article that I drew from for this post.